As you know, a supernova was recently discovered in the bright galaxy Messier 65; the Virtual Telescope helped confirming it while it was still waiting for an official designation. Now, it is named SN 2013am and resulted to be a type II supernova, found when it was very young. Unusually cloudy weather made almost impossible for us to provide further follow-up, but the sky finally cooperated on 27 Mar. 2013, when it was clear for about 30 minutes (thanks, clouds!). 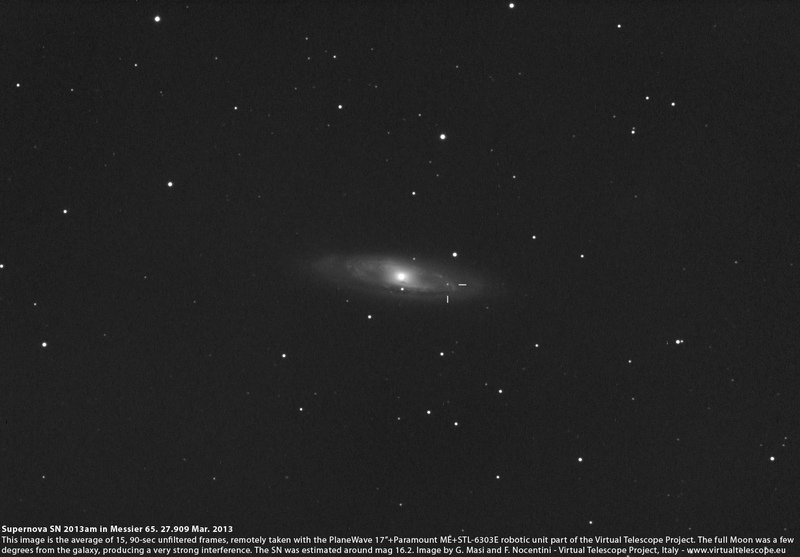 Promptly, the 17″ robotic unit part of the Virtual Telescope Project was slewed to image M65, while the full Moon was about 30 deg far, making a very bright sky. The exploding star was clearly visible on each raw image and an average of several of them makes it very evident. Its brightness increased just a bit since the discovery, very likely suggesting this supernova is highly obscured (otherwise, it should much brighter).